When you're just starting out, you don't want to spend a fortune, but you still need a good, adjustable tabletop easel to work efficiently. This one will make your painting life a pleasure. Its price is sure to bring a smile to your face as well. It holds a canvas up to 27" (69 cm) tall. Crafted from solid, seasoned hardwood, it has a beautiful hand-rubbed oil finish and a functional design. It features dovetail construction, polished nickel-plated hardware, and a genuine leather handle. 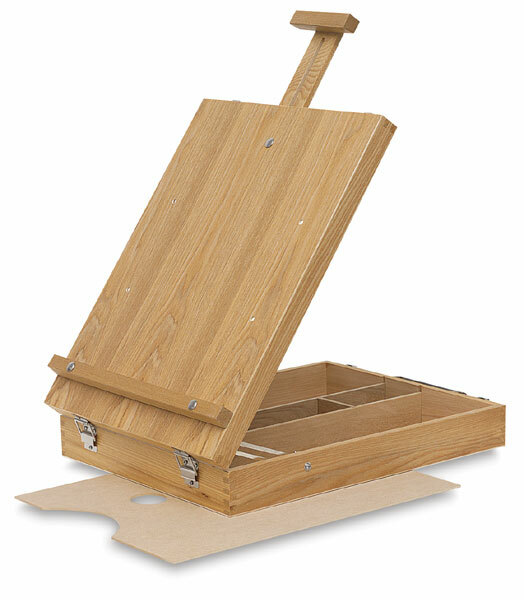 Five fixed compartments are included, plus a palette and a canvas holder with adjustable tilt.